I'm so happy to be able to write another travel post! As most of my readers already know, I stated back in January in THIS POST that I probably wouldn't be traveling as much as I use to and that I would be most likely taking day or weekend trips and writing monthly 'Adventure Posts' instead. However, plans changed because we received a surprise wedding invitation in the mail to the beautiful state of Colorado and we thought "Well, if were going to drive all the way out there for a wedding, we might as well make a vacation out of it!". And here I am, writing another vacation post, with many more to follow. Our destination was fourteen hours away. We decided that since the wedding was on a Sunday, we would leave on Saturday and drive ten hours the first day, and only four hours the second day so that we would have plenty of time to get to the wedding. Because we weren't sure if we would be allowed to check into our hotel before the wedding, we had to wear our wedding clothes while traveling on the second day. After spending the night in North Platte, Nebraska, we crossed over the border into Colorado and I happily had Todd take my picture under the Colorado sign. It's always exciting to reach our destination after a long car trip! 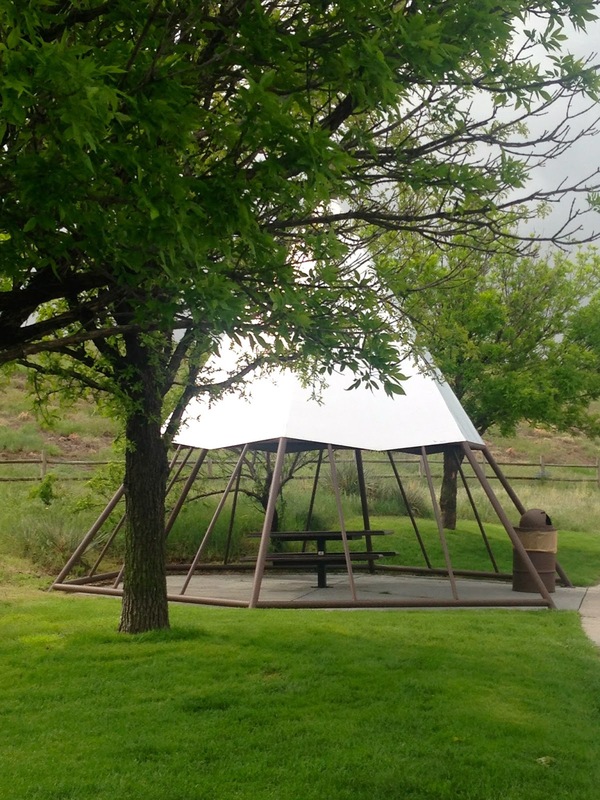 The rest area that we stopped at in Colorado had these cute tee pees placed over their picnic tables. Isn't that a creative idea? The wedding was at 4:00 p.m. and we actually got to the area about noon and had time to eat, and even go shopping. And yes, the hotel was kind enough to let us check in early, so we were able to freshen up a bit too. If you missed my wedding post, you can read all about that HERE. 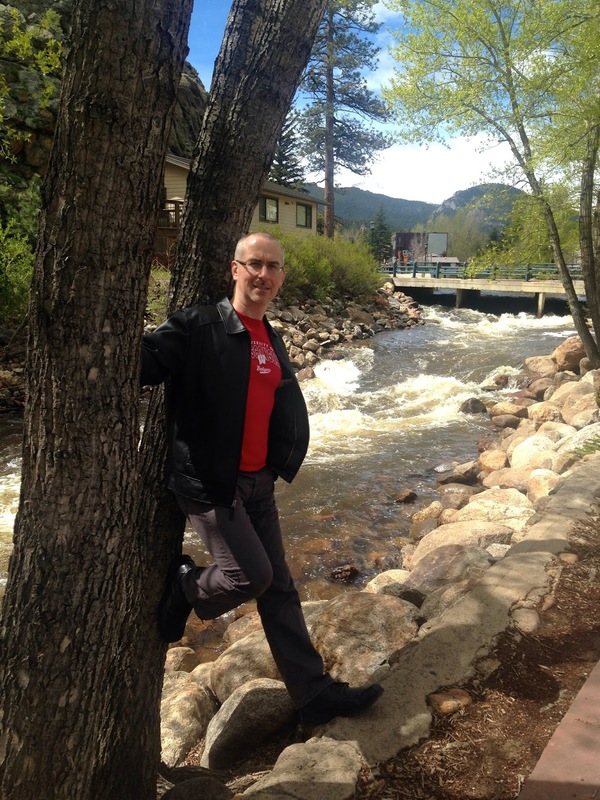 The next morning, we were up bright and early and after a delicious breakfast and some fun conversation with friends from the wedding, we headed out for Estes Park. 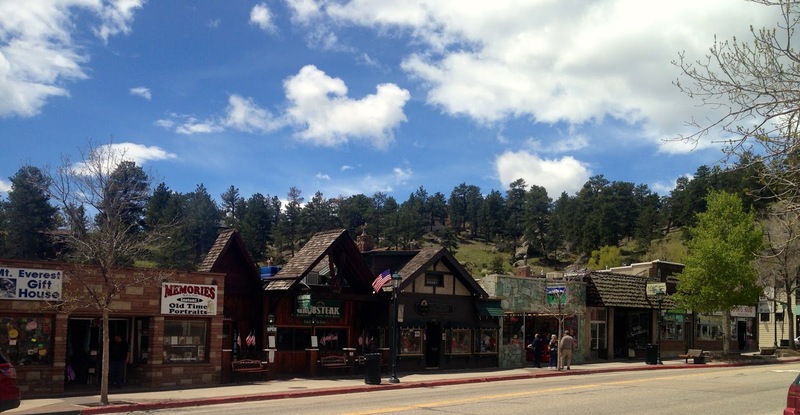 Estes Park is a quaint little town nestled by three sides of the Rocky Mountains, at the base of Rocky Mountain National Park; thus the views from just about anywhere in town are spectacular. It lies about 7,522 feet above sea level, so the weather is always a tad cooler there. Because of that fact, we decided to spend our first day in town, since that was the coldest day all week, and go into Rocky Mountain National Park the next day when the weather was predicted to be warmer. 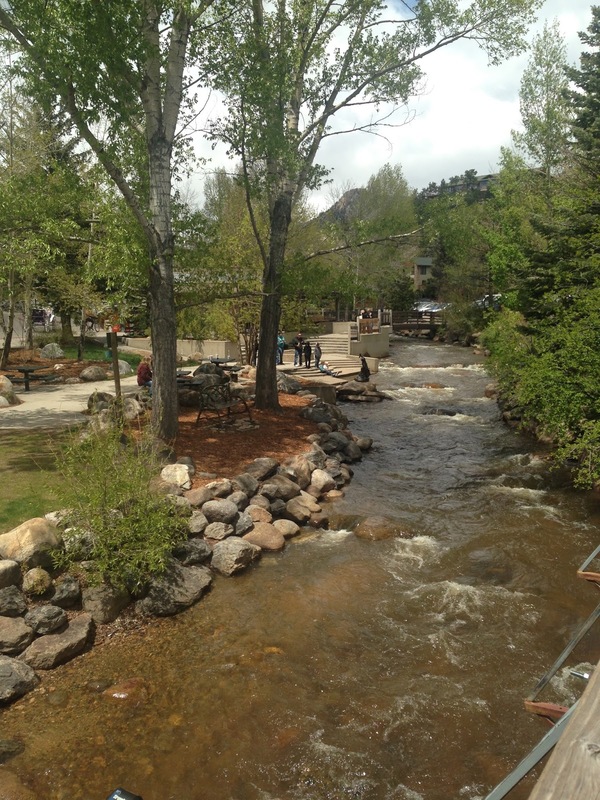 The town has a lovely river walk that meanders behind the main street and across the street to the other side. When we first got to town, we took the river walk behind the stores, since they were just starting to open. 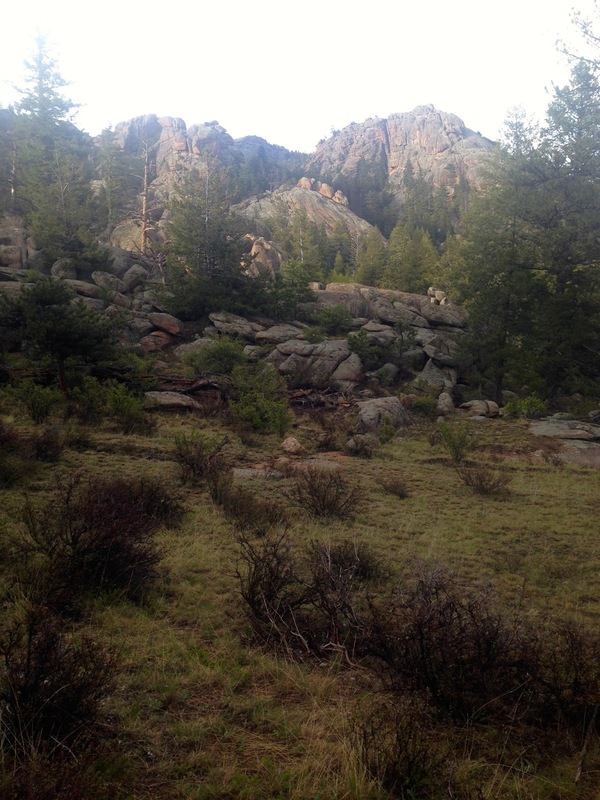 The area is known for plentiful wildlife, Elk, Big Horn Sheep, Bears, Mountain Lions, etc. 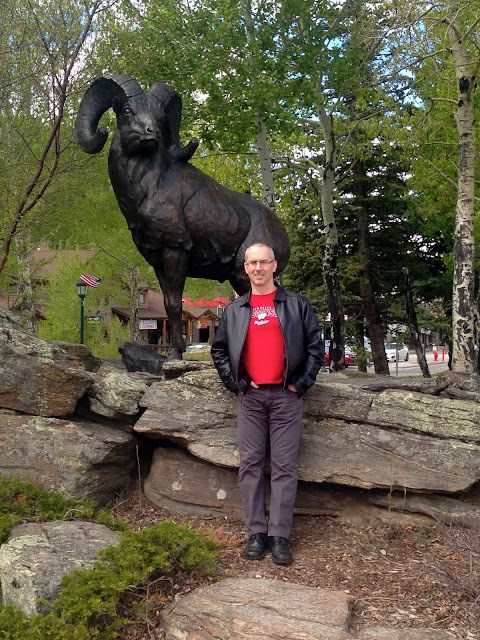 We did encounter a lot of wildlife on our adventure, but to our disappointment the only Big Horn Sheep we saw was this statue. 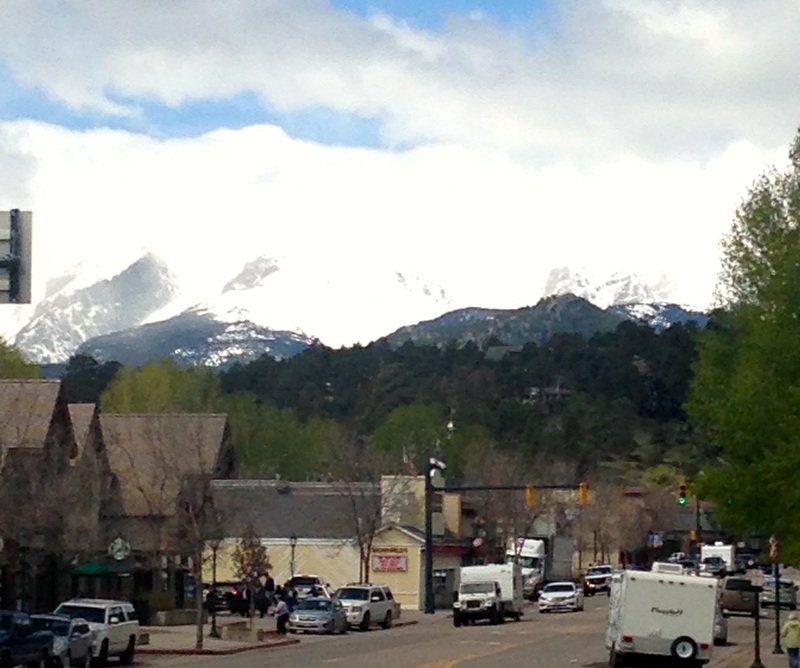 On the main street you have a constant, gorgeous view of the snow-capped Rocky Mountains. 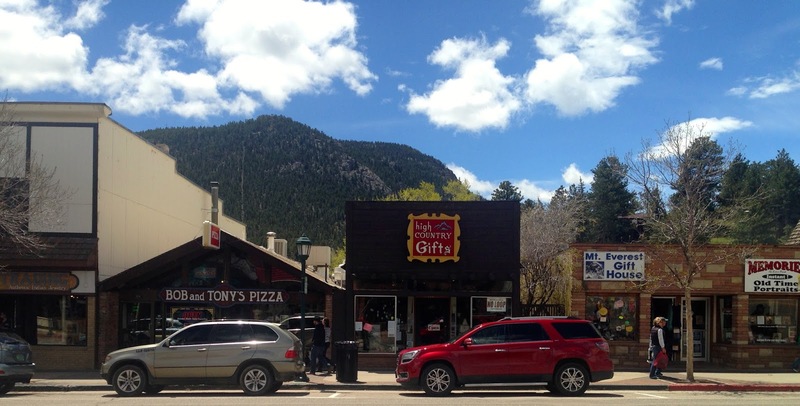 The town is filled with gift shops, ice cream and candy shops, and restaurants. I bought a couple of tee shirts to add to my travel quilt, and of course, CANDY! We were fortunate to be there on Memorial Day and they had a outdoor fair going on at that time. There were many wonderful artists and food booths. 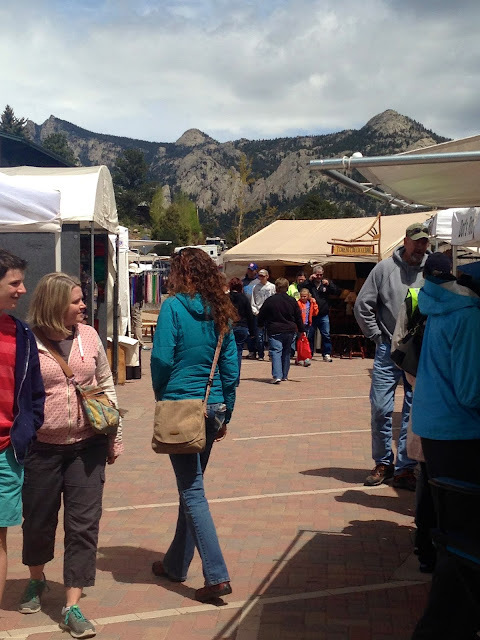 We enjoyed looking at all the talented art work, and smelling all the food…especially the roasted corn and toasted almonds. We saw jewelry made from real butterfly wings (made from butterflies who died of natural causes), furniture made from wood destroyed by beetles, and great photography. I marveled at the beautiful items these people could create out of items that others would consider worthless. 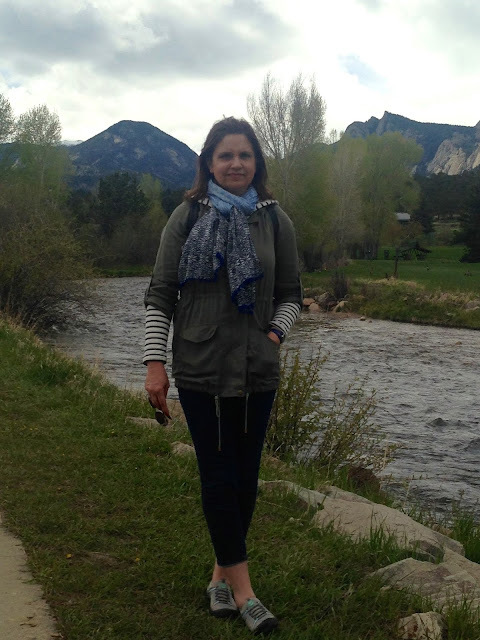 Although I would have loved the butterfly jewelry, I restrained myself and bought a small photograph of the Rocky Mountains as my souvenir. Well you know when I saw this dark chocolate toffee in the store window I had to go in and get some! My husband and I bought a tub of it and we munched on it for the duration of our trip. 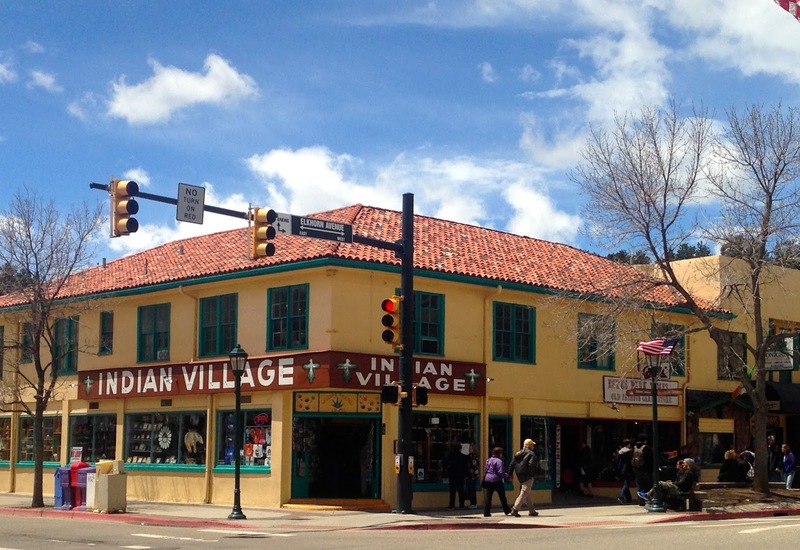 A store that sells Native American souvenirs. This is the oldest operating movie theatre west of the Mississippi. Views of the store fronts/restaurants on the main street. 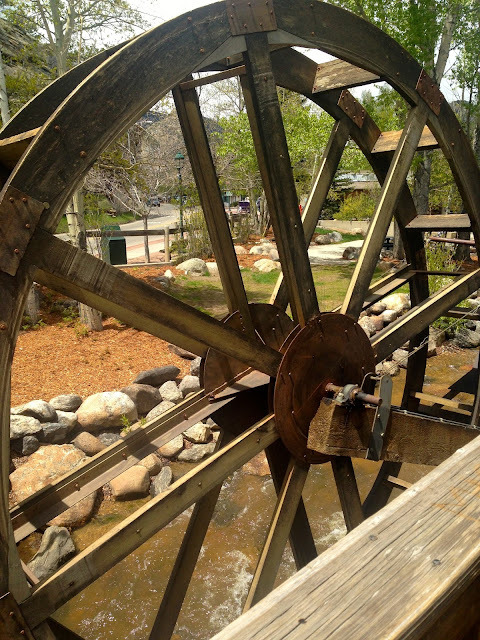 On the other side of the river walk, is a working water wheel and an area where you can dip your feet in the icy cold mountain waters. But just a toe, for it is FREEZING water! It was a brisk day as you can tell by this photograph. Even though it was the end of May, I had a sweatshirt (with a tee underneath), a utility jacket, and a scarf on to keep me warm. There were horse and buggy rides available if you wanted to ride through town instead of walk. 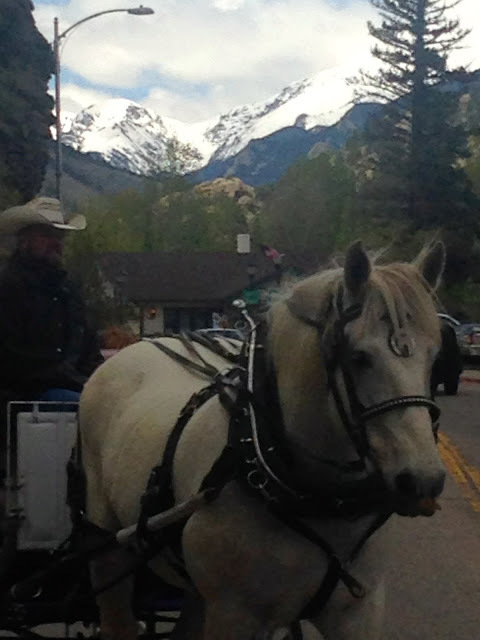 Notice the gorgeous mountain view behind the horse? Wow! After we finished walking about town, we decided to head to Lake Estes to do more walking. The lake is surrounded by beautiful paths with mountain views. You can rent pedal carts and bicycles to ride on the path too. 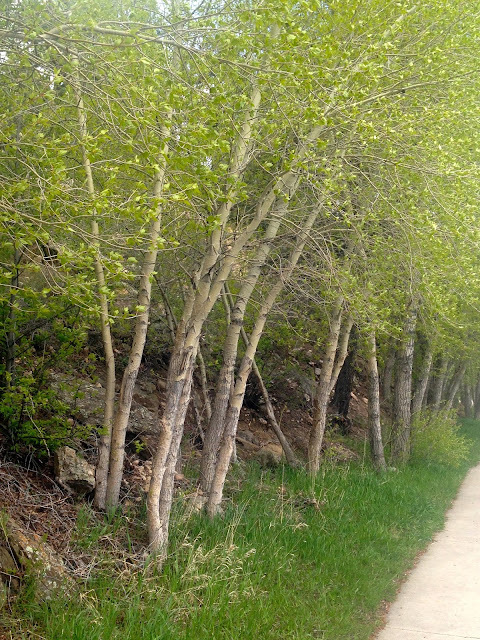 Beautiful Aspen trees gracing the side of the paths. Colorado is well-known for this tree. On my last trip to Colorado I bought a necklace made with a leaf from a Colorado Aspen tree. There were lots of people fishing and boating on this lake. 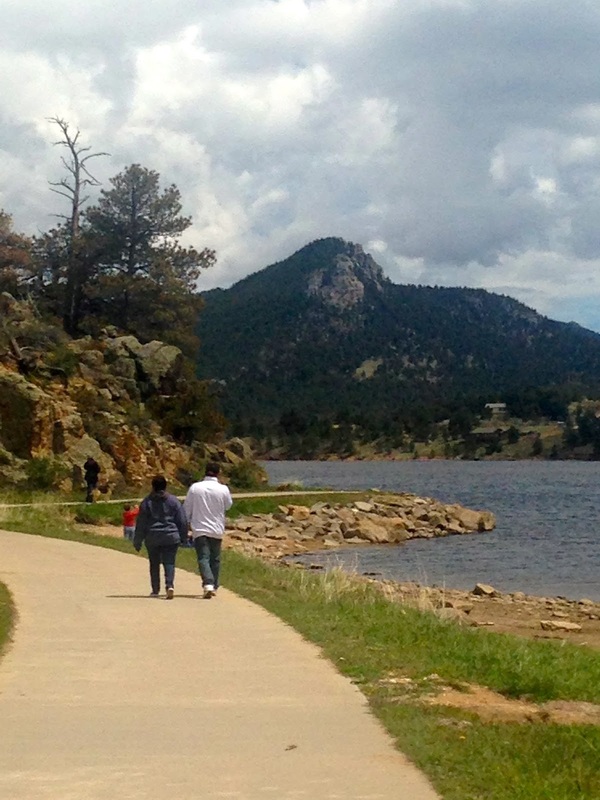 The path also leads to the Estes Park Visitor Center. 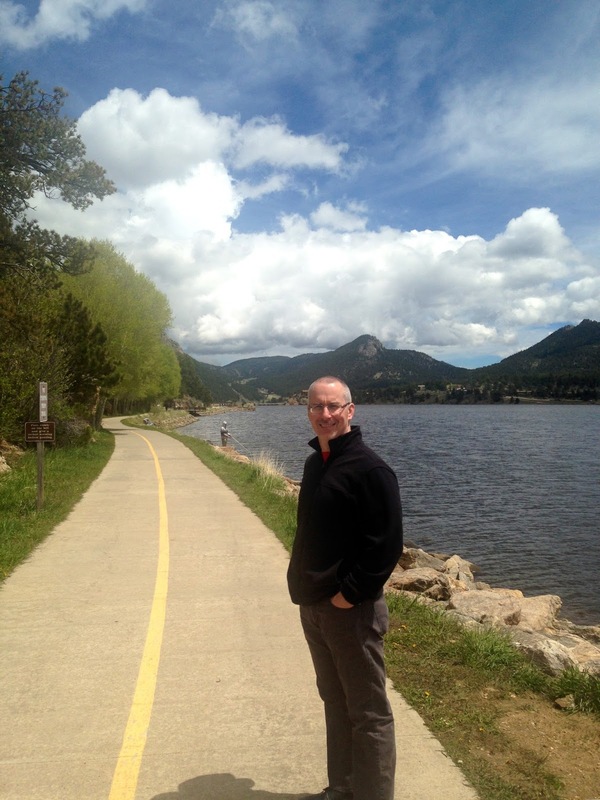 When you take this path, you leave the lake views behind, and enjoy views of the golf course and river instead. 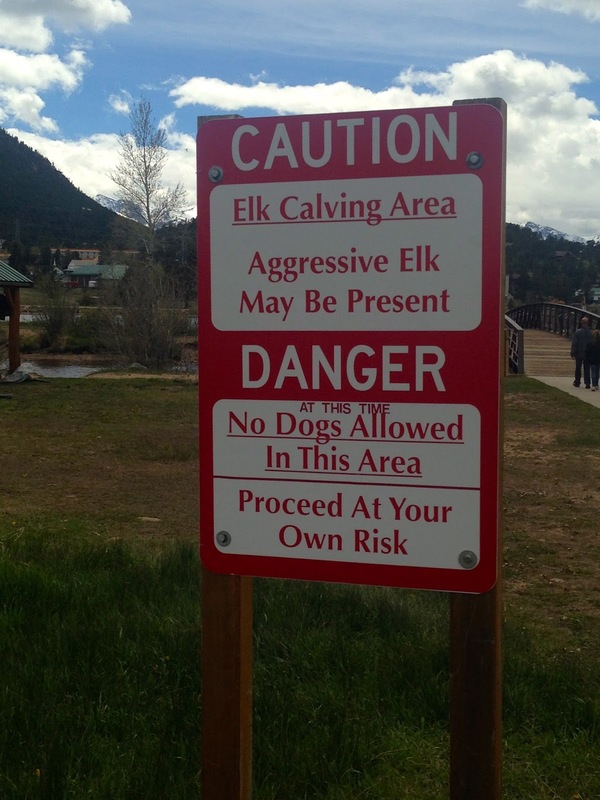 However, the elk also enjoy the golf course and these warning signs are present. We didn't see any elk on our walk, for they come out early in the morning or at dusk, and we were there in the middle of the day. The beautiful river view with the Rocky Mountains behind. By now, I was getting tired. For we walked all morning in town, and now again on this trail. My hip joints (an old work injury) were started to ache. But it was so pretty, I trudged on! 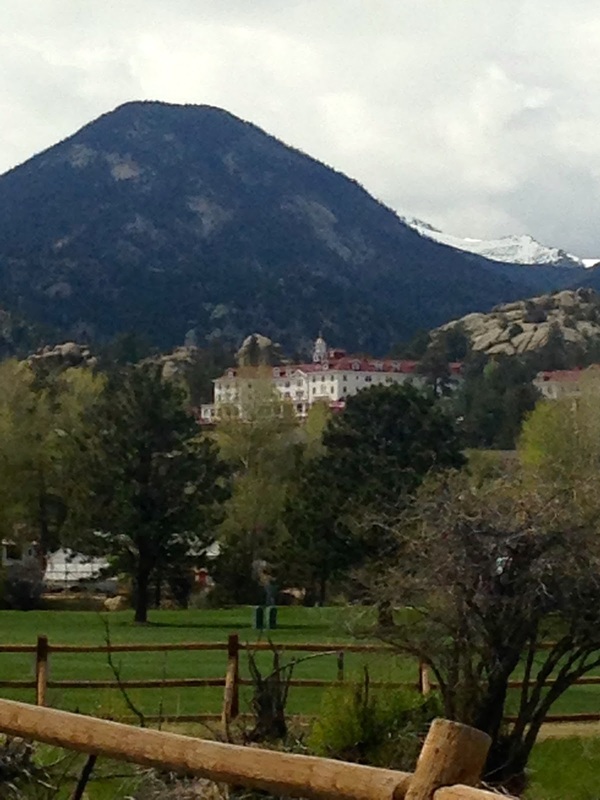 Pictured below is The Stanley Hotel which was the inspiration for Stephen King's novel "The Shining". 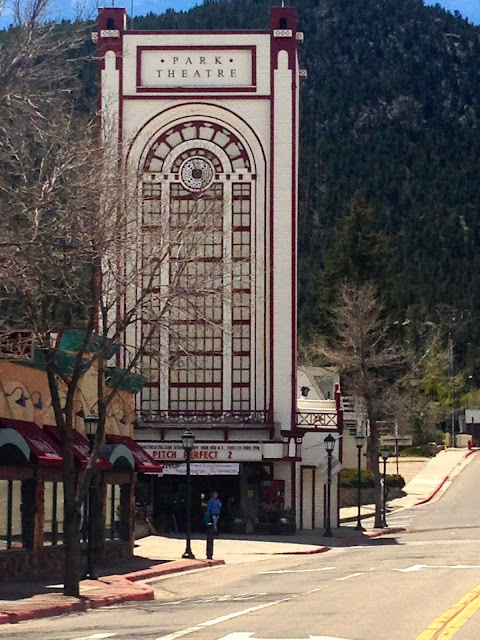 Although the movie was not filmed here, the mini-series was. You can read all about that HERE if your interested in ghost stories. Although we drove around the grounds of this hotel, we did not go inside. We met a mother goose and her babies on the river walk. Well, you can imagine after hiking all day and having nothing but toffee for lunch that we were pretty hungry. So after checking into our hotel we went out to eat at The Big Horn Restaurant. It was just a simple diner….but those are the places we love to eat when were on vacation. We don't care for fancy restaurants; we love the mom and pop places that give you good home style food, big portions, and reasonable prices. 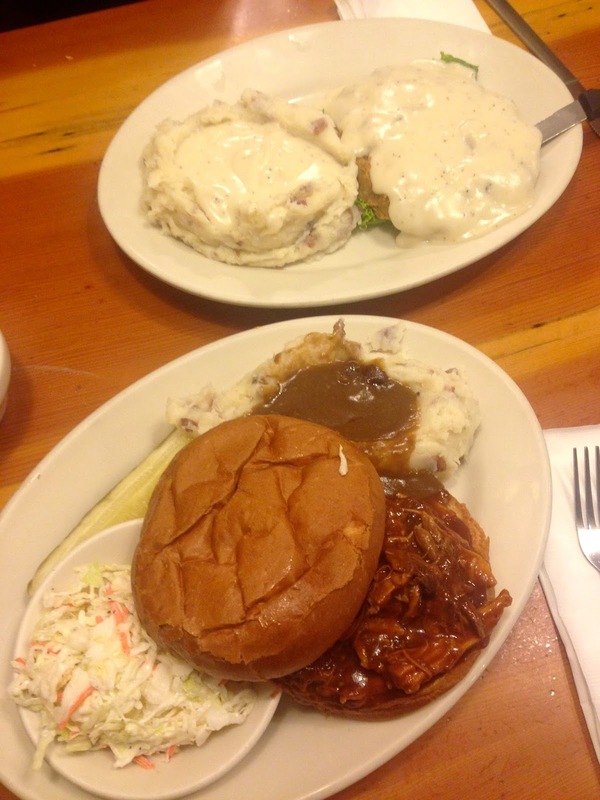 My husband ordered his customary country fried steak with mashed potatoes and white gravy and I ordered a barbecue sandwich with mashed potatoes and brown gravy. The barbecue was delicious! I love the roll it came on…so big and hearty. I also loved their potatoes….I like it when mashed potatoes are made with red potatoes and you can see the skin mixed in. You know they are going to be good when you see those chunks of red skin! 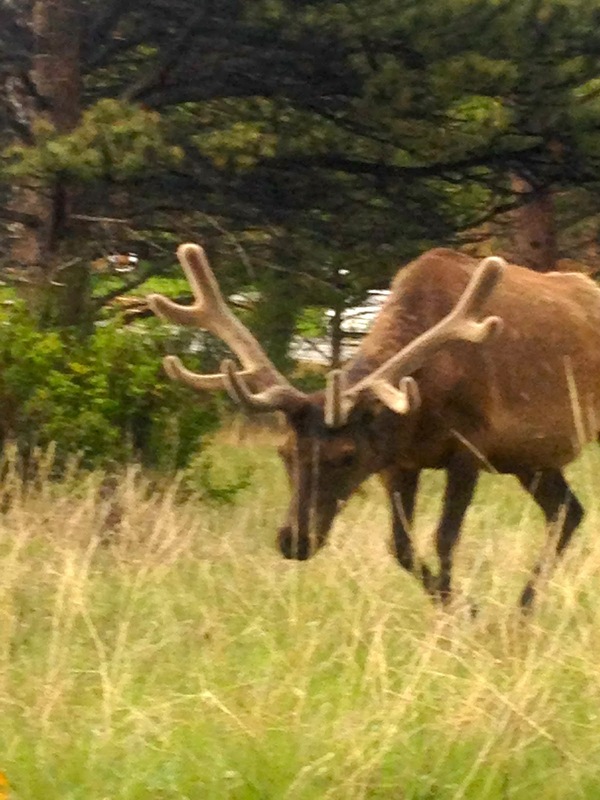 We had read that elk were so plentiful in Estes Park that they are frequently seen walking downtown streets, but I had to see it with my own eyes to believe it. Now, I see deer almost every day where I live, but I've never seen a creature in the wild as large as this in my life. And I didn't just see one, I saw hundreds, if not thousands. They were everywhere! As we continued our drive, we spotted this herd in a front country yard. The fences do nothing to keep them out. We also saw mule deer, but unlike elk, those creatures move quite a bit faster and I couldn't get a picture of any. By now we reached the destination of our hike, but honestly, I was too nervous to hike. It was dusk, the time of day when all the animals come out, and the area we were hiking was very desolate and I was worried about coming across a bear or mountain lion. I had read about 'What to do if your attacked by a bear or mountain lion' in a visitor guide earlier that day, and it scared me to death. Not to mention all the elk warning signs we saw earlier in the day, so my nerves were on sensory overload. Nevertheless, we started our hike anyway, after all, that's what we came to the Rocky Mountains to do! 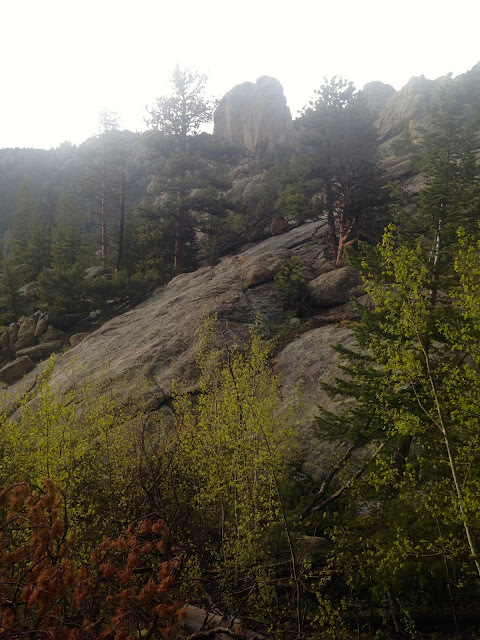 The boulders and rock formations we saw on this trail reminded me very much of our visit to The Garden of the Gods, except this trail was deserted, and that trail had lots of people on it! We walked for a little bit, but I was so nervous I kept jumping at every little sound, and then I would chuckle when it turned out to just be a rabbit or chipmunk. 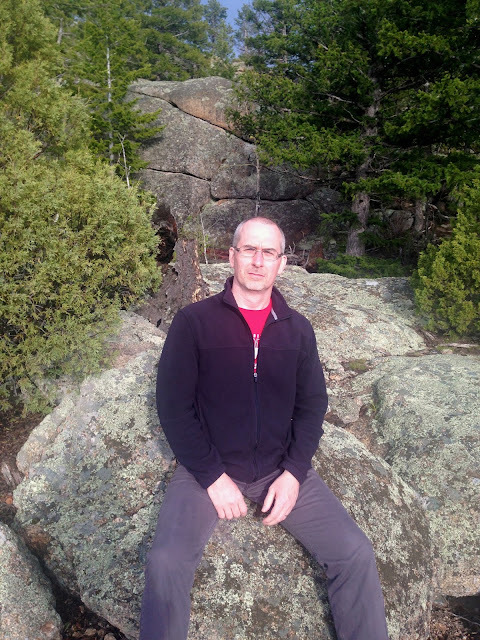 How was I going to handle hiking in Rocky Mountain National Park tomorrow if I was this nervous already, I wondered? I then asked my husband if we could turn back, for it was really getting late and I was getting tired, so we did. We got back in our car and enjoyed more gorgeous mountain views. 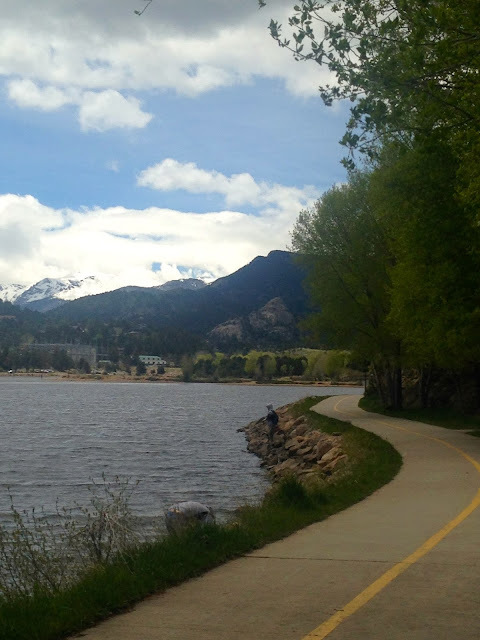 In the picture below, if you look just to the end of the road, you can see the town of Estes Park. 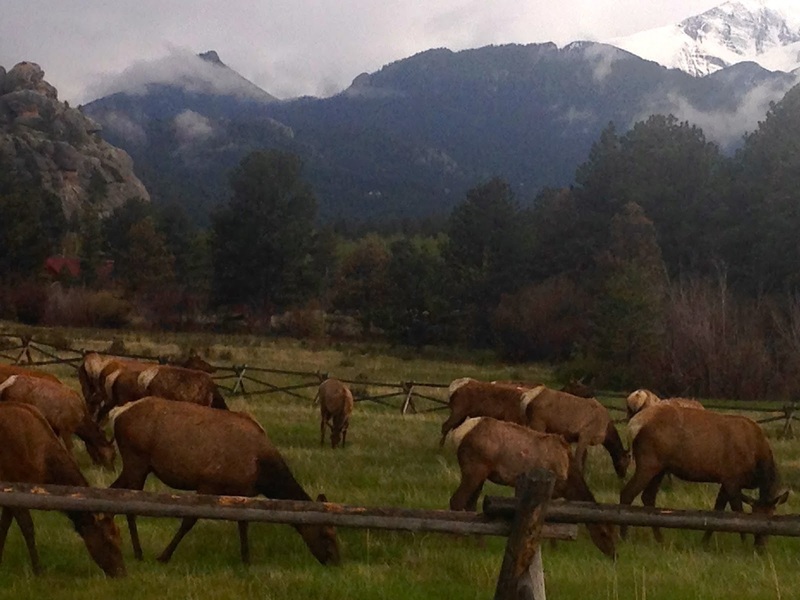 On our way back to the hotel, we saw more elk and stopped to take pictures. I could not believe how unafraid of us they were. We could get so close to them with our car we could have reached out and touched them! I'm an avid bird lover, and one of the things I love to do when I travel is look for birds that I don't have in my home state. I was thrilled to spot this bird for I have never seen one like this before. I think it's a black-billed Magpie…please, if I'm wrong correct me. I really don't know for sure. I just looked it up on Whatbird.com when I got home. More elk grazing on a field right above the town. 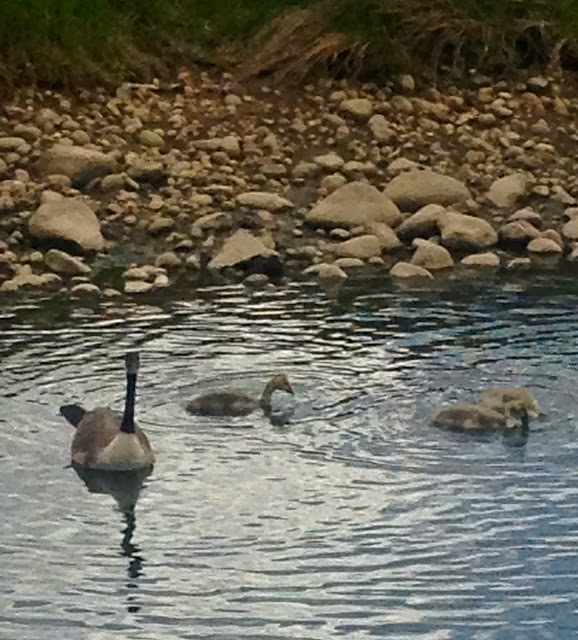 Here are some close-ups but they are very grainy because the zoom lens on my IPhone doesn't work very well. By now, we were ready for some R&R and headed back to our hotel room. 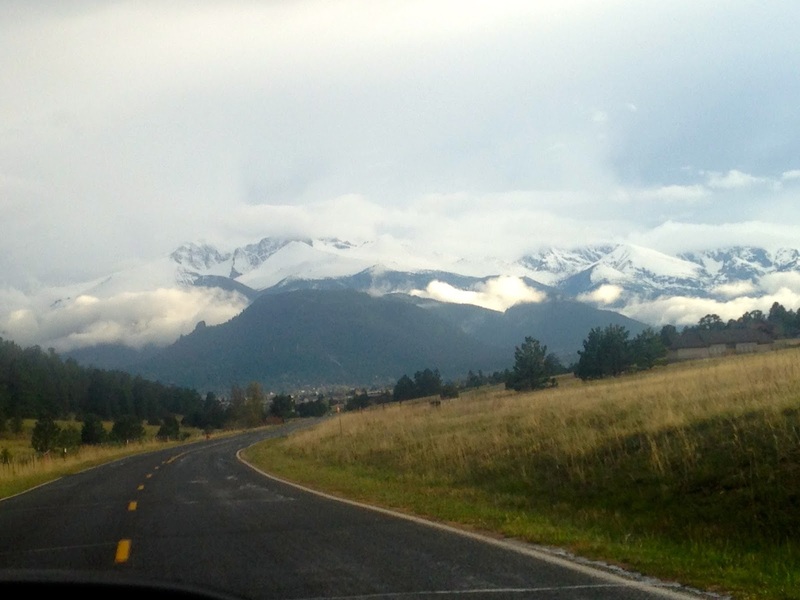 Tomorrow was the big day: ROCKY MOUNTAIN NATIONAL PARK!!!! Hopefully I would be able to enjoy myself, and my nerves would not get the best of me. I will tell you all about that adventure next week. Wow! 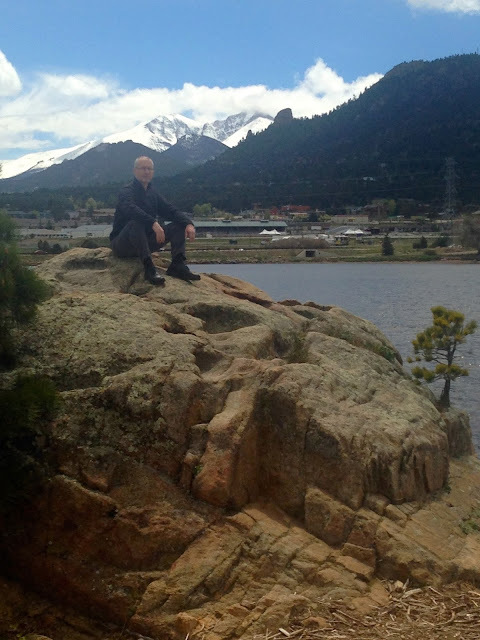 what a fantastic visit to Colorado and what a hike in such short time with wonderful photos. 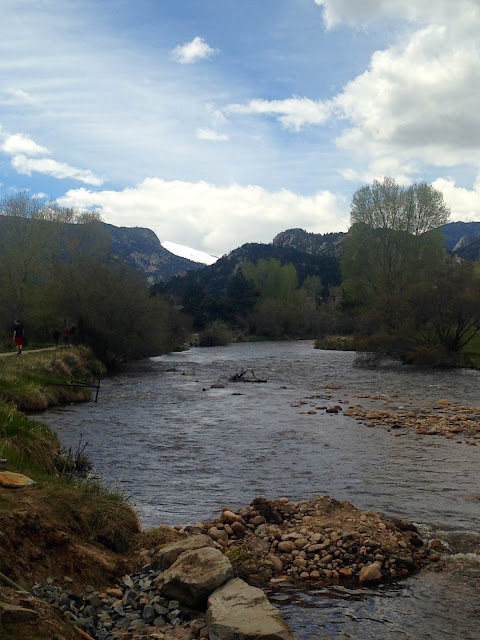 I wish to go there one day as I have never been to Colorado before. What a fun trip! Your photos are amazing! 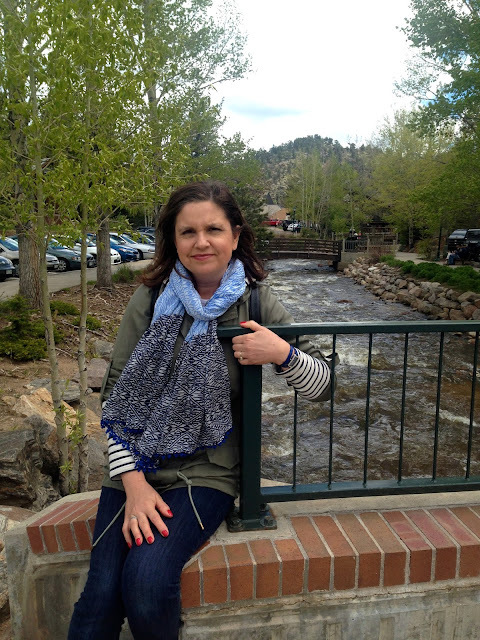 Amy, I always enjoy your travel posts. Such beautiful photos and I loved hearing about your hike. So cool about The Stanley - I immediately recognized it, as that book still is one of the scariest I have ever read. Looking forward to reading more about your next day hike! I have been to Estes park two times and loved both times! 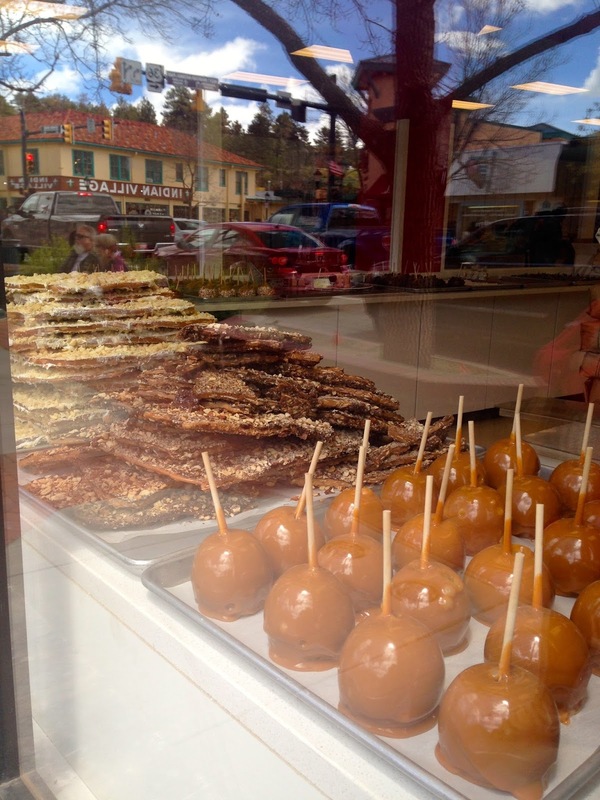 I remember seeing those caramel apples, too. 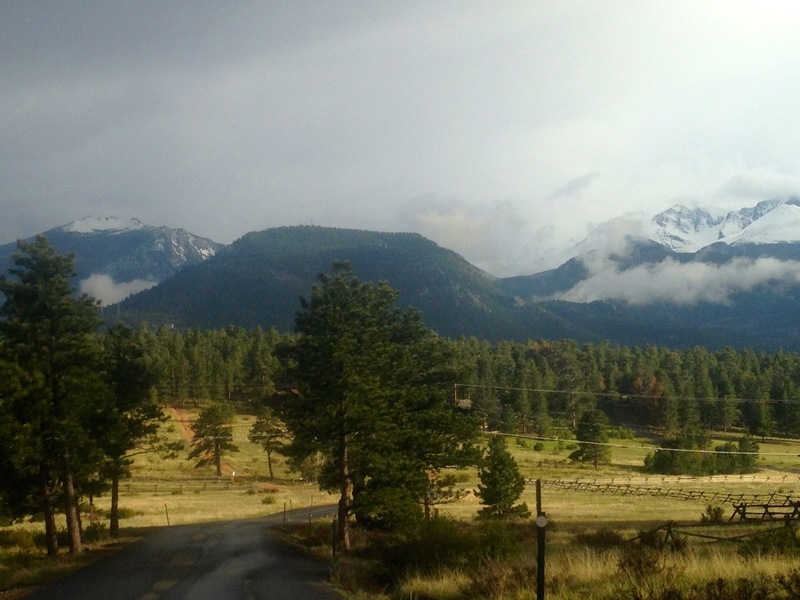 We had a cabin in Estes park for our second trip, such beautiful views. Your outfit looks perfect for the cooler weather, love the military jacket, stripes & beautiful scarf! Beautiful photos. 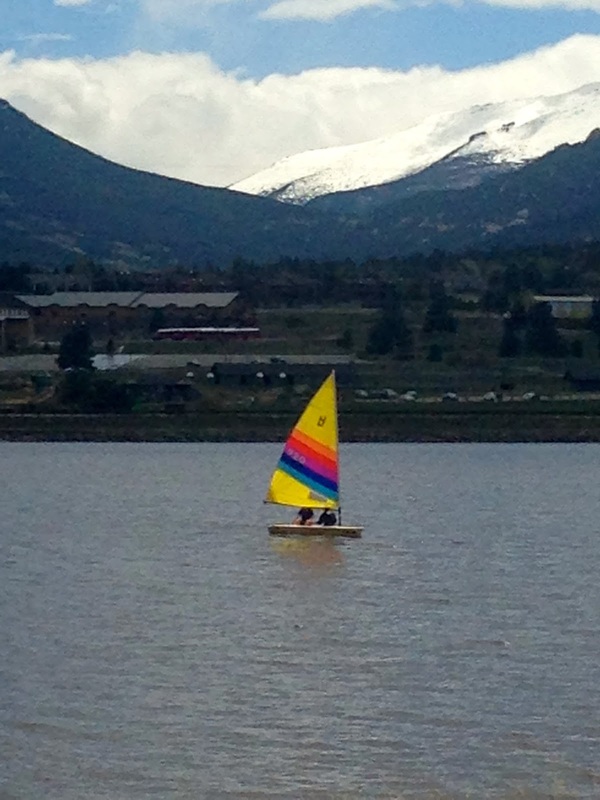 I've never been to Colorado, but it's on my bucket list. Thank you for linking up with Thursday Favorite Things and I hope you have a glorious day!